This DIY kit includes everything you'll need to create your own fresh sushi rolls. Why go out for sushi when you can serve your own, handcrafted sushi rolls right in the comfort of your own kitchen? Carley Sheehy wondered the same thing, and created this DIY kit which includes everything you'll need to create these Japanese delights that are as fun to make as they are to eat. Get started with the popular sushi roll recipes included, or add a medley of your own ingredients to construct a custom-made roll that's jam-packed with your favorite flavors. 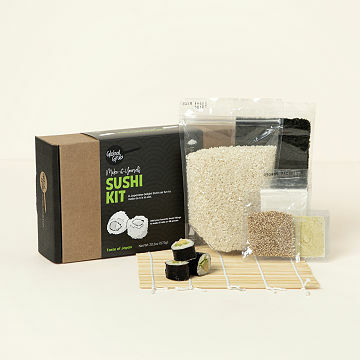 In addition to a rolling mat, easy-to-follow instructions, and helpful drink pairings, the kit also comes with the base ingredients for four servings of sushi, including sushi rice, rice vinegar powder, nori—the special seaweed used to bind rolls—sesame seeds and spicy wasabi powder—just add your favorite fillings! Made in Livermore, California. Click here to learn how to use your Sushi Making Kit and check out our Gift Lab to see a member of our team put the Sushi Making Kit to the test! This kit was a great gift for my significant other, who loves Sushi! I liked that the kit includes everything that you need to make the sushi, besides the extra fillings. The directions were pretty easy to follow, but watching the tutorial video they recommended certainly helped. I gave this to a friend who had never made sushi before. It has everything you need (except the raw fish of course) and easy to follow directions! We cut up some sushi-grade tuna and salmon and made A LOT of rolls. It was delicious and fun! Great gift for someone looking to learn how to make sushi! I want to buy one for myself now! My brother and his wife LOVE sushi and they were really excited to use the kit! We have not made any sushi yet, but my boyfriend was thrilled at the presentation of this gift, especially with the exact directions and suggestions of what to make! Not many options for getting sushi where i live. Good gift/social activity. Neatly packaged and ready to gift. I was excited to get this and give it to my daughter as she and her boyfriend are obsessed with Sushi. Seems like a fun idea to learn how to make their own at home. This kit comes with step by step directions. This kit arrived today and I although it looks like it will be fun, I'm very disappointed in the way it was packaged. The kit did not come in a box as pictured above, but in a plastic bag with a cardboard overlay. The cardboard overlay was ripped, and the rice had come loose inside the bag and is now just spilling over into the bag where the rest of the kit components are. Meanwhile, the box in which the kit was shipped was in perfect condition. I'm slightly embarrassed to give this as a gift now, as it looks sloppy and I am hesitant to order any similar kits. While I'm pretty excited to be giving this as a gift to a friend, and really hoping she'll share with me the results of her efforts, I'm pretty disappointed in what arrived. The page shows a very nice box with a picture of the contents. Nicely packaged and easily gift-wrapped. That's not exactly what arrived, so I dropped my review to 4 stars. FABULOUS ANNIVERSARY PRESENT FOR A SUSHI LOVER! WHETHER IT WORKS OR NOT -- WHO CARES? WE GET TO EXPERIENCE WHAT IT'S LIKE TO PREPARE OUR FAVORITE DINNER OUT. FABULOUS!